In 1982 General Motors Pontiac Division introduced the new third generation Firebird. Firebird, Formula and Trans Am were beautiful and new. Every Firebird, Formula and Trans Am 1985 through 1992 had the back tail lights panel bezel insert adorned with the new Firebird logo. This logo was painted onto the lens. In 1985, 1986, 1987, 1988, 1989 and 1990 just the Firebird appeared. In 1991 and 1992 both the Bird and Pontiac name was shown. GTA has an exclusive Pontiac name in 1991 and 1992. 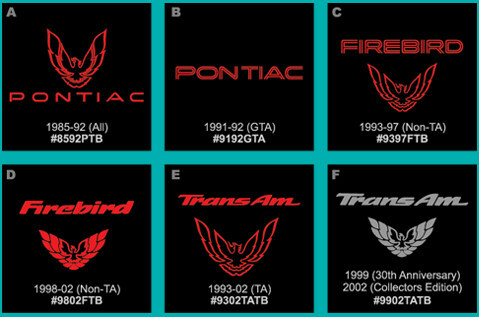 1993 1994, 1995, 1996, 1997, 1998, 1999, 2000, 2001 and 2002 Firebird Formula and Trans Am now had bolder artwork on the tail light lens. Either FIREBIRD and Bird or TRANS AM and Bird existed. Typically the art was red. Special colors existed for 1994 and 1999 Anniversary Trans Am (White); and 2002 Collector Edition Trans Am (Silver). Gold was also used in the very early years. Get this inexpensive decal stripe for your restoration today. A stencil is also available if you want to paint them on like factory.